Cheerful fun in the same vein as Tenchi. ...A slightly geekier Tenchi Muyo, with a gateway to a sci-fantasy world instead of aliens. Meet Makoto Mizuhara: He's brilliant, good-looking, and a heck of a nice guy, even if he has the social awareness of your typical president of the high school physics club. (Oh, wait... He is the president of the physics club.) H's a kid without an enemy in the world... except for Jinnai, the evil, nefarious, megalomaniacal, and just plain bad school president. Paranoid to the core, Jinnai blames Makoto for everything tragic that has ever happened to him. When the ruins of an ancient civilization are discovered in the basement of Shinanome High School, it's exciting stuff for Makoto. 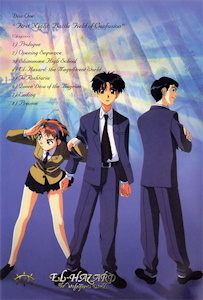 Until those ruins end up opening a portal to another time and place, into which Makoto and Jinnai are immediately plunged, along with Nanami, Jinnai's sister and entrepreneur extraordinaire, and Mr. Fujisawa, the school's unshaven, drunken, mountain-climbing history professor. The... quadro (what are you supposed to call that?) end up in the magical land of El Hazard. Makoto and Mr. Fujisawa are dropped in the middle of the peaceful kingdom of Rushtaria, just in time to rescue Princess Rune Venus from the depredations of the vicious Bugrom. They accompany her to the capital, where it is discovered that Fatora, Venus's spoiled (and, by the way, lesbian) sister has been kidnapped by the Bugrom! Since Makoto essentially looks like the male version of Fatora, there is only one possible solution to avoid spreading panic among the populace.... So Makoto (now in drag and reluctantly masquerading as the Princess Fatora) and Mr. Fujisawa set about trying to find a way back to Earth. El Hazard is a creation of the same nuts who brought us Tenchi, and it shows. Once again, we have a fine, up-standing high-school lad surrounded by attractive but incredibly strange women, which makes for plenty of awkward situations and relentless humor. But there are plenty of differences... Makoto isn't spineless, just clueless and way too considerate of other peoples' feelings, and while there are quite a few women pursuing hapless Makoto, it's made truly obvious by the end of the OAV's who he's supposed to end up with. The humor of the series is a bit more low-key than Tenchi, but just as hilarious. Like Tenchi though, El Hazard is capable of getting serious from time to time. The supporting cast is riot, and provides plenty of interesting subplots, such as the stilted and awkward love affair between the romantically-challenged Mr. Fujisawa and the desperate-for-a-husband-no-matter-what-the-cost-in-humanity Miz Mishtal. In fact, they're so good it's kind of insulting to call them supporting characters. The art style is very similar to Tenchi's, perhaps even a bit more colorful, with plenty of rich backgrounds and character designs. Music isn't truly exceptional, but it's still quite good and it gets the job done. The intro and ending themes aren't half-bad either. The voices are suitable, and the dubbed version isn't bad at all. Five-second haiku: El Hazard is a perfect choice for the Tenchi fan, or anyone else who likes their anime light, funny, and full of adventure. 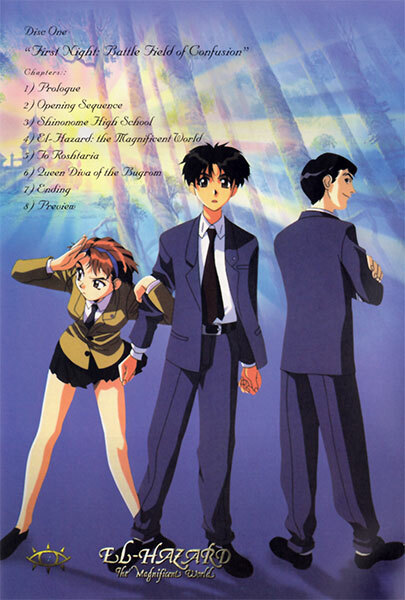 Note that though the second OAV series continues this story (they're now packaged as a set), the first TV series (The Wanderers) is a complete re-make. The second one, however (Alternative World)s, takes up where the OAVs leave off. Available in North America from Pioneer on a hybrid 3-DVD box set. Was originally available on four subtitled or dubbed VHS volumes, now out of print. El Hazard: The Magnificent World is Copyright © Pioneer Entertainment / AIC. Any images are the property of their respective rightsholders, and included for review purposes only under the fair-use clause of US copyright law.